Audio Source: Clint Mansell - "Requiem for a Dream (Remix)"
I think that’s my unofficial tagline for this video. Okay, this was originally intended as an event-opener for AmeCon 2006, a UK Convention.. I just hadn’t told *them* this. By the time the AMV competition deadline had passed, I stopped speeding through getting it finished, and went back and tweaked things, changed bits, added silly references in, and messed around. Despite being horribly late, they liked it enough to still show it during the event as a non-competitive entry, and it got a good reception, hurrah! The issue is this: with all the changes and rehashes I made, I’m not entirely sure it still has any point or sense to it. It’s still just fun though. 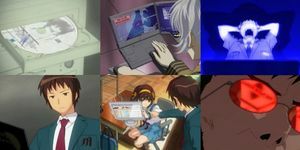 I also term it “Anime Characters Typing at Keyboards: The AMV”. This is my fourth AMV, and my first multi-source video. It was a lot tricker working with so much more choice, yet a subject matter that still narrowed it down to scrabbling for footage. It’s also a far cry from the months I’ve spent on the last two; this video took me under a month to create. So, yes, the concept? It’s loosely set in a bleak future, where for undescribed reasons, a black monolith decends to Earth bearing only the Org’s logo. Humanity discovers from this divine message that the only way to survive/evolve/reach higher understanding/etc is futher individual talents and creativity with one-man remixes, thus all original team-made content is banished and the editors of the world compete to win… er.. just. win. yeah. That’s as much sense as it will make; it was meant to be an epic trailer-style AMV event opener, it’s not the same if the fate of the world isn’t at stake now, is it? By the time I finished, there were over 35 different sources and little one-shot references involved here. That is, however, counting random shots that are totally unrecognisable to the series so guessing those would only be valid to people who know that series far too damned well. I’ve gone nuts on the Org entry, listing even series I’ve used for little more than a few frames – but even so the non-anime stuff is missing, so the full list is as follows, and I’m ignoring the 2001 reference because it’s only implied. A few random ones in there, the dark screens with the Half Life G-Man on? That’s cut from Still Seeing Breen, a music video edited by Paul Marino, and its presence is my little shout-out to the Machinima community. Chibi-Sadako is indeed Sadako from The Ring films, only in cute chibi-form as a somewhat old 2ch/4chan meme. I still find the concept of taking the most forlorn undead horror film character and turning her into a cute girl coming out of mobile phones and Game Gears is oddly hilarious. Machinae Supremacy and Lemon Demon, their appearances feel a little too obvious ;) Still, both are hewn from stones of pure awesome, very different stones, but hey. They are in no way a hint towards possible soundtracks of future videos, nope. DaiCon IV – Well, if you don’t know about it, brush up on your anime history dammit. All that junk aside, I hope you enjoy it as much as I did making it. Please check your brain in at the door, turn the lights off, bump the speakers up and please pretend to be awed. Surprisingly for something only meant as a competition opener, it won more than anything else of mine! But I got an AMV badge so it’s all good. Entries feed › Powered by WordPress and Gallery2, theme: Blueberry, heavily modified › 23 queries in 0.879 seconds.